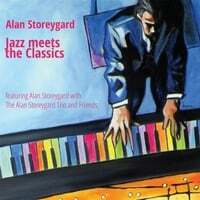 Jazzing up the classics isn’t a new concept, but Alan Storeygard’s Jazz Meets the Classics is something special. 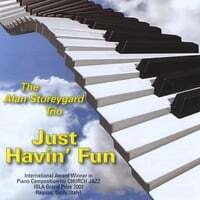 Some of the pieces are solo piano and some include The Alan Storeygard Trio and Friends. I think two things that make this album exceptional are the selection of music and the fact that Storeygard seems to really know the originals. Obviously, there are many changes to these nine classical pieces, but Storeygard is very faithful to their essence, if not to the notes themselves. The CD includes a colorful eleven-page booklet with comments about the music, notes about the composers, and more. 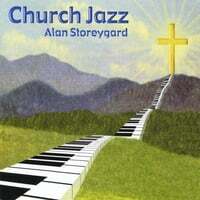 Storeygard’s award-winning debut album, Church Jazz, was released in 2001; Jazz Meets the Classics is his fifth album. Jazz Meets the Classics begins with Rachmaninoff’s “Prelude in C# Minor,” one of my favorite classical pieces. Fully orchestrated, the middle “interlude” section is mostly solo piano and has some blues chords and jazz rhythms that bring it right into the 21st century. I’ve always loved the power and emotional depth of this piece, and I like Storeygard’s arrangement almost as much as the original. “The Moldau Symphony” by Bedrich Smetana is arranged as a tone poem in the style of Hector Berlioz. The first half of the piece is a piano solo, and the second half cuts loose with the jazz trio. “Beethoven’s 9th Symphony” is laid-back and again features the trio – very cool! Three of Chopin’s pieces – “Ballad 1 in G-Minor,” “Nocturne #2 in Eb” and “Waltz #6 in Db” (plus some snippets of his “Waltz in C# Minor”) – combine to make a compelling 12 1/2 minute piano solo. It’s more classical than jazzy, but the piece really soars! Love it! One of the bigger surprises on the album is a medley of “The Star Spangled Banner” with an ending from Puccini’s “Nessun Dorma.” Even more surprising is how well it works! It was originally arranged for a concert in Italy in 2005, and Storeygard’s Trio was invited to perform it again at Carnegie Hall in 2011. The longest track on the album is an almost 17-minute performance of Rachmaninoff’s Second Piano Concerto. “Alessio’s Song” comes from Jacques Offenbach’s “Tales of Hoffman.” It is arranged as a tone poem, again in the style of Berlioz, and this arrangement was inspired by a concert performance by Italian classical pianist and opera singer Alessio Quaresima Escobar. Performed as a graceful and lyrical piano solo, it’s a beauty! The elegant jazz piano arrangement of JS Bach’s “Jesu, Joy of Man’s Desiring” is played at a slow tempo that imbues the piece with a poignance not usually associated with it. Tchaikovsky’s First Piano Concerto has been adapted, arranged and performed by a wide variety of artists and is one of the more popular classical pieces. 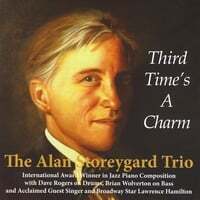 Storeygard’s arrangement is fully orchestrated with a big, rich sound and brings this excellent album to a close. In general, I would say this album is more classical than jazz, but the arrangements really work and the album is a joy to listen to! Jazz Meets the Classics is available from Amazon, iTunes, and CD Baby. Highly recommended to those who enjoy the classics with a twist!